The revolutionary EMD SD60M and the GE Dash 8-40CW wide cabs were the new look in 1990 when this exciting Union Pacific program was produced. This was also a time when the Union Pacific's ambitious steam program had given rise to frequent steam powered freight and passenger trains pulled by 4-8-4 #844 and 4-6-6-4 Challenger 3985. Broadcast quality video footage by Dave Gross with narration by Rege Cordic. * EMD SD60M - Union Pacific mainline east & west of Cheyenne, Wyoming. * GE Dash 8-40CW - Action along Union Pacific mainline. * 4-8-4 #844 - St. Louis NRHS Convention freight. Kansas Pacific freight. Idaho Centennial passenger. * 4-6-6-4 #3985 - Cheyenne to LaSalle freight. APL Double Stack freight. River City Roundup Freight. rrvideojunkie (usa) on 2014-12-12 18:54:26. Great program showing the UP steam and diesels that roamed the rails in that era. It's great to hear the soothing pipes of Rege Cordic with the narration. A pleasant narrator voice has much to do with the quality of a program. There are railroad programs out there that may show good action and picture quality, but have narration that is most irritating to the senses. That detracts from watching one of these programs. No such problem with this video. Nate (Woodlynne, New Jersey) on 2012-08-31 16:54:21. 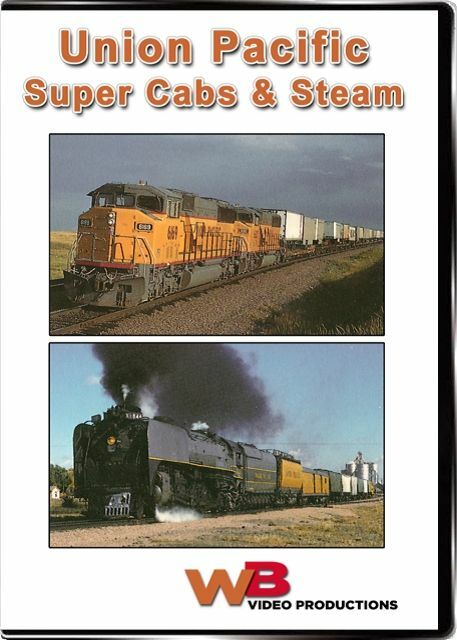 Great DVD, it brings the best of both diseal and steam in one action packed show which features 3985 and 844 both pulling freight and excursion trains!!!! Steamboy (Revere MA US) on 2018-03-01 08:05:00. Throughout 1990, Union Pacific did a fine job of hauling regular freight and special Passenger Excursions, Not only was WB Video there for the 844 & 3985 Segments, but also Pentrex was there too. Today the C40-8 Units are mostly Retired and/or gone for scrap, but as a New England resident Myself, Pan Am Rail did a fine job of Purchasing 20 of these units that used to Work for CSX and are now Repainted in Dark Blue Livery due to either a Locomotive Shortage, or a Stand-by unit in case the PAR's own Diesels are having mechanical issues.